StartupItalia, the innovation magazine of the Italian startups, has just published an interview with our founder, Vittorio. 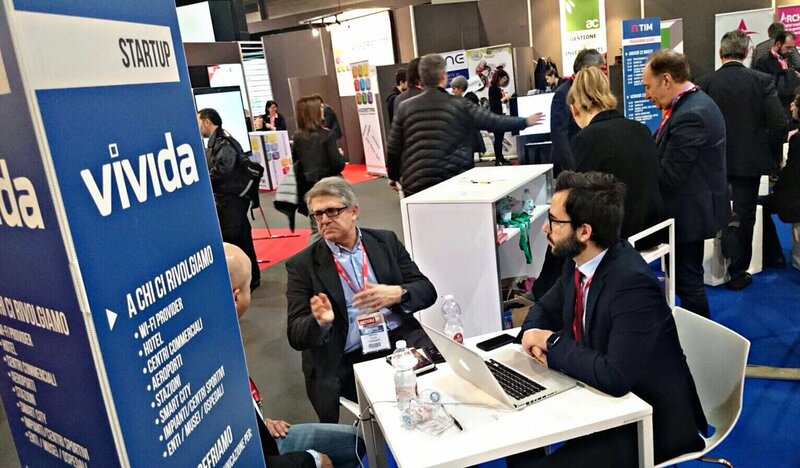 You will find, in Italian, background, genesis, key partners, values and perspectives of vivida. Click here to read the original italian interview. Otherwise, below there is the interview translated into English. Vivida, the startup that develops mobile browsers from before the arrival of smartphonesInterview with Vittorio Costa, one of the founders: “In large companies, often where there is information technology, there is conservation, not innovation”Vivida is a Lazio startup launched between the end of 2011 and the beginning of 2012 by a team composed (also) by engineers: Vittorio Costa, Vincenzo Capuano, Andrea Pietrini and Daniele Pagani. This entity, after participating at TIM WCAP, today provides innovative and non-intrusive solutions to mobile operators, Wi-Fi service providers and business customers who open new digital communication spaces with their users. Vivida has created a software platform managed in Cloud Computing for the Mobile Internet: OverBrowser, that offers new communication spaces to companies and organizations of all kinds to the “mobile” users, on smartphones, tablets and laptops connected via 3G, 4G and Wi -Fi. Specifically, it intercepts normal internet browsing and superimposes a semi-transparent and non-intrusive icon, typically consisting of the company or corporate logo. When clicked, the icon is replaced by the OverBrowser Panel, located over the visited web page, which presents -dynamically- any type of digital content: from links to certain pages, to banner ads, scrolling information, photos, videos, maps, new menus with new pages. We asked a few questions to Vittorio Costa, Ceo and one of the founding members of Vivida. Can you explain in simple terms what your startup deals with? Companies and organizations all over the world spend a fortune to provide wi-fi services, but users after the login phase … are lost forever. Vividaweb, or more simply “vivida”, makes visible what today is not visibley, ie the business and services on TLC and Wi-Fi networks. How? generating New Communication Spaces overlapping Web pages on any device and browser, without any need for the users to download software. With OverBrowser, those offering Wi-Fi services are always visible to the users, through Icons, panels, notifications, banners and any type of content and multimedia service. To engage users, inform them, collect feedback, study their behavior and monetize everything that can be monetised. With OverBrowser and the other Vivida platforms all this is finally possible and can be activated in few hours, with exceptional results in terms of click through and conversion rates. Let’s take a step back: tell us the story of your startup and your team. We were dealing with mobile browsing even before the advent of smartphones; Vincenzo Capuano and I, founders of Vivida and inventors of the OverBrowser, have been working together since 2002 in this sector, with Openwave, Novarra and finally Nokia. It was the time when Telecom Operators and website developers tried to make mobile Web browsing accessible on the small screens available on those days. With the arrival of the iPhone 3 and 3G networks the phenomenon of disintermediation of mobile operators exploded: the interaction with users has become a private issue of OTTs, visibility and monetization of services have become a mission impossible for everyone else; for a while someone lived in the illusion that the solution was in the Apps. Well, there are 5 millions of them, but what is the ratio between those actually used and those ignored or deleted? How much does it cost to develop and maintain them? how much do they make? We have always believed in browsing, and the facts proved us right: it remains the best place to interact with mobile users. We were supported by Manageritalia, by the Lazio Region with a “European” grant, by the Centro ImpreSapiens of Sapienza University and also by TIM’s Strategy & Innovation structure. Thanks to them and to our new partners, Emiliano Pierdominici, Andrea Pietrini and Antonio Sbardella, who have brought precious skills, our platforms have strengthened, enriched, diversified and made dozens of use cases possible, not only on the mobile network but also on Wi-Fi. Our team, made up by the founders, people more innovative than young, has then been enriched with excellent, innovative collaborators who, bless them, are also young people! We work in “hyper-smart-working” mode, in the sense that our office is the Web, our meeting room is virtual; only occasionally we sit together at the same table. Everyday life is videocalls between people in Rome, Rio, Barcelona, ​​Doha and … in the Castelli Romani, where we have our “TivoliLab”, the real beating heart of our research. Our focus (never changed a pixel on our mantra: “make your business visible”) and our technology (patented and phenomenal algorithms to unleash everywhere, now also on the app, our new communication spaces) have led us to be protagonists in the most varied places, from Macao to Luanda, from the heart of the Grande Raccordo Anulare (the Roman equivalent of the UK M-25) to Fiumicino, London, Atlanta and Latin America with, at the begining, prototype solutions and now general available solutions, ready for the massive launch.